Description: Over the years I'd saved a bunch of my empty Asthma inhalers because I knew I'd one day make some art out of them. This day came. Addiction has played a significant role in my life. I wanted to create a scene that showed an element of dark humor. I also wanted to present it in an innocent way. 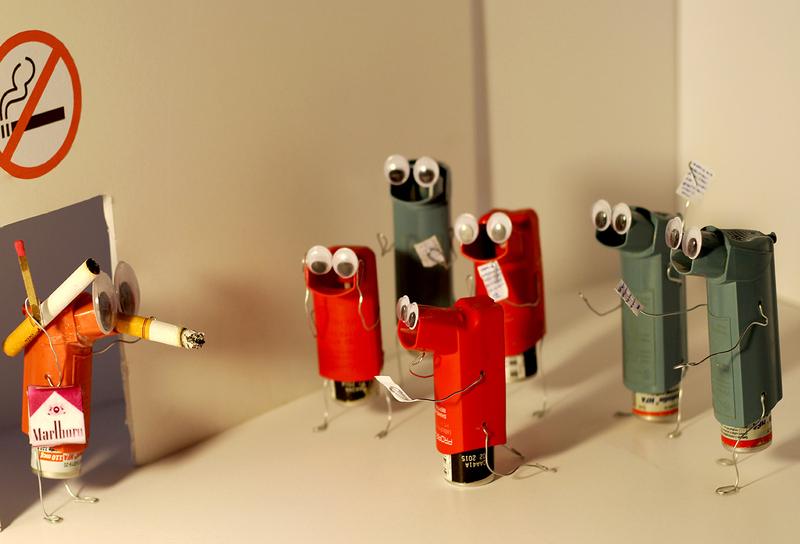 I believe that the inhalers with googley eyes do just this. The irony of the inhaler addicted to cigarettes is the way I decided to show addiction, and how it affects everyone around them. In this picture all of the inhalers friends and family members have gathered together to surprise the inhaler with an intervention. They all have their letters ready to read to their addicted loved one. I tried to position the inhalers in a dramatic way, each with their own individual personality. I put large googley eyes on the addicted inhaler to show the surprise on its face after walking into the room and discovering what was taking place. There is a ton of pain that revolves around addiction, so I wanted to take a moment to create a piece of art that softened this subject. I'm also a fan of dark humor because there is an element of truth in it. I've learned that sometimes the best way to address my own pain is through art.